Eastleigh boss Ronnie Moore was disappointed for the supporters, who made a 600 mile round trip, only to see the Spitfires lose 4-0 away at Barrow. "Barrow are big and strong and we couldn’t cope with it. I never thought a team of mine would be beat up the way we were. “The whole game changed on the penalty decision. To give the goal away like we did…. “We were caught on the halfway line. Coulson’s got to know what he’s doing and who’s around him there. “He gets block tackled and we’re flat as hell at the back and the lad’s clean through. “They leave at three o’clock in the morning and we go and perform like that. “I was embarrassed and they (the players) should be embarrassed. “We were brittle and powder-puff today. “We’ve got loyal fans (who deserve more). After the impressive 3-0 win on Tuesday night to beat Torquay, Eastleigh came into today's game in good spirits. Today, however, was a different story as it turned out to be pretty horrific and one to quickly forget as Eastleigh went on to suffer a heavy 4-0 defeat away at the hands of Barrow. With BT Sport covering the game on TV, the 46 traveling Spitfires fans had to leave in the ridiculously early hours of the morning for the mid-day kick-off. These loyal supporters must be praised for their efforts and commitment but sadly on the pitch, it was a day to forget for Ronnie Moore's side. With both Reda Johnson and James Constable unavailable for Eastleigh, Connor Essam and Ryan Bird came into the starting eleven. It was all square at half-time after a goalless first half but the game's dimension changed dramatically for the worse for Eastleigh just three minutes after the restart. 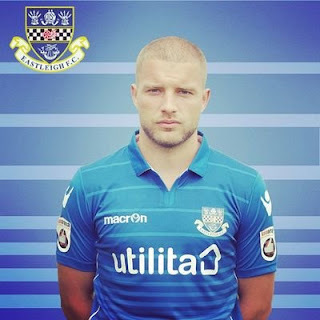 Ronnie Moore says that striker James Constable is unavailable for Eastleigh's televised fixture away at Barrow after suffering a knock to the head in the Spitfires 3-0 win over Torquay on Tuesday night. “He won’t travel. He got a fair-sized bump on the side of his cheekbone and was semi knocked out. There’s a five-day rule after a blow to the head, so he can’t be involved. We’ll take Adam Dawson in the 18 instead. Looking ahead to the game, Moore said: “It should make a good TV game, but sometimes they end up as a boring 0-0 and you wonder what all the fuss was about. “It’s very close between us, but Barrow are in the position we want to be in. If we get a result, it’s got to put us in the top five surely. “We know they’re decent, but we don’t need to go there gung-ho, we’ll just play our game. Eastleigh Announce Further Subsidised Travel | Eastleigh FC Chairman Stewart Donald has kindly donated a percentage of the TV money received from our FA Cup First Round tie against Swindon Town, to fund the reduction in away travel cost. We look forward to seeing as many supporters make the trips prior to the busy Christmas period. Eastleigh moved up to seventh place in the National League after a 3-0 home win over Torquay United. Ronnie Moore made three changes to his starting eleven with Ryan Clarke returning in goal just days after his personal heartache. Jamie Cureton made his first start for the Spitfires and James Constable also came back in to the starting eleven to partner 41-year-old Cureton in attack. The players to make way were Ryan Huddart, Ryan Bird and Mikael Mandron. After a somewhat dull and goalless first forty-five minutes, the Spitfires opened the scoring a few minutes after the break to begin the second half in a positive way. Jamie Cureton flicked the ball home with a diving header to get on the end of Luke Coulson's cross. As the game went on, it looked like it would be a narrow victory for the hosts, but suddenly the Spitfires struck twice more in the closing minutes to seal a rather more convincing 3-0 scoreline. Eastleigh boss Ronnie Moore has said that his goalkeeper Ryan Clarke wants to get back out on the pitch despite the pain and tragedy of sadly losing his father at the weekend. Moore said: “Ryan’s dad liked football and that’s why he got involved in the game. “His dad would have wanted him to play and Ryan wants to handle things his way. “Playing will keep his mind focused on something different for an hour-and-a-half and all the pain comes back after the game. In terms of injury news, Moore says that Reda Johnson is likely to miss out on Tuesday night's game at home to Torquay due to a hamstring injury. “It’s tightened up a bit on the same leg and possibly there’s a bit of scar tissue. Speaking after Eastleigh's 0-0 draw away at Lincoln City on Saturday, Spitfires boss Ronnie Moore said: “It reminded me of League Two football today. “No one got the breakthrough, but both teams can play in League Two, no doubt about that. “Not many teams are going to come to Lincoln and win. “They’re a bit like us, they’re well organised and they’ve got good quality. That’s why we cancelled each other out today. “We didn’t play as fluently as we’d have liked with the ball, but at least we defended when we had to. Defender Joe Partington almost helped the visitors to break the deadlock late in the game when he went up for a header forcing his marker into heading the ball against his own crossbar. Eastleigh battled to a goalless draw away at third-placed Lincoln City. The Spitfires have dropped to tenth in the table, but it could prove to be a very valuable point come the end of the season against a side who are also challenging for promotion. Despite their current league position, Eastleigh are just three points off fifth place and five off second place so are still within touching distance of a play-off place ahead of a home game against Torquay on Tuesday night. Eastleigh haven't lost away from home since Ronnie Moore took charge. They are unbeaten on the road in six games. Young Arsenal loanee 'keeper Ryan Huddart was drafted into the starting line-up for the visitors as first-choice goalkeeper Ryan Clarke was unavailable due to the sad loss of his father. Our condolences and thoughts are with Ryan and his family at this difficult time. Eastleigh's FA Cup tie in the First Round at home to Swindon Town has been selected to be televised on BBC Two. The Spitfires will take on their League One opposition on Friday 4th November at the Silverlake Stadium. The coverage will start at 7:55pm. Ronnie Moore reacting to the news said: "The only reason the cameras are coming to us is they think there’s going to be an upset. “But there’s no pressure on us. We’ve got nowt to lose, we’ve just got to enjoy it. It’s a chance for one or two of our younger lads to express themselves on TV and show how good they are. “I’d imagine we’d get 5,000 into the Silverlake and there will be 2.5 million watching on TV. “It’s going to be a special night for the club and what we don’t want to do is get beat by seven. "We want to show the world just what a good team we are and how professionally we’re doing things here. 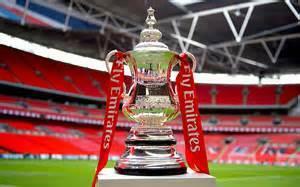 “The FA Cup has never been a hindrance for me, I love it for the atmosphere and the shocks. Congratulations to Eastleigh's Luke Coulson who has been called up for England 'C'. The Spitfires' midfielder has been in stunning form for Ronnie Moore's side scoring six goals so far this season. Coulson's well-deserved inclusion in the England C squad will see him travel to Estonia in Talinn for an International Challenge Trophy match next month on November 15th. 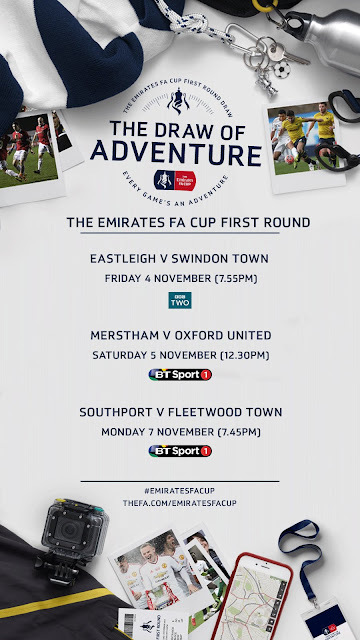 Having beaten North Leigh comprehensively in a 6-0 win on Saturday, Eastleigh have been drawn at home in the First Round Proper of the Emirates FA Cup against League One side Swindon Town. The tie is set to be played at the Silverlake Stadium over the weekend of November 4-7. North Leigh have issued a statement of appreciation after Eastleigh chairman Stewart Donald's "wonderful gesture" of donating Eastleigh's share of the gate receipts from Saturday's FA Cup tie to their eighth-tier opponents. “Towards the end of the game, it was announced that the total receipts from the game would be donated to North Leigh by the chairman of Eastleigh FC, Mr Stewart Donald, who is a local West Oxfordshire resident with very strong personal and family connections to the North Leigh chairman Peter King, stretching back over 20 years. The Spitfires soared into the First Round Proper of the FA Cup after a thoroughly convincing 6-0 victory at home versus North Leigh. Ronnie Moore's side suffered their first defeat under his management last week in the league against Dagenham & Redbridge, but today was all about the magic of the cup. Last season Eastleigh went on a history-making run in the FA Cup where they eventually lost to Bolton Wanderers in the 3rd Round, having taken the then Championship side to a replay. Along the way, Eastleigh saw off competition from league sides such as Crewe Alexandra in a truly memorable FA Cup campaign. Despite being an injury doubt before the game, Ryan Cresswell returned to action to partner Reda Johnson, back from a one-match suspension, in the centre of defence. Joe Partington and Jai Reason take a look back at Eastleigh FC's record-breaking 2015/2016 FA Cup run. Dagenham & Redbridge halted Eastleigh's 10-match unbeaten run as the Spitfires suffered defeat for the first time under Ronnie Moore. Eastleigh made two changes from the side that beat Maidstone 3-0 on Tuesday night. Adam Dawson & David Pipe replaced the injured Jake Howells and suspended Reda Johnson. 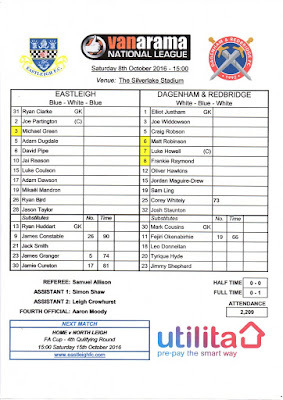 Young defender Jack Smith and forward James Granger were named amongst the substitutes for Eastleigh. With the Spitfires somewhat depleted in defence due to Johnson's one-match ban and Ryan Cresswell still recovering from a calf injury, Joe Partington played in the centre of defence to partner Adam Dugdale and David Pipe deputised at right back. Moore: "We've thrown away two points"